The Anne Arundel Medical Center began its history as the Annapolis Emergency Hospital, at the top of a hill that was then on the outskirts of Annapolis. 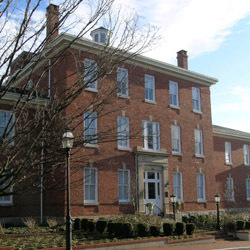 In the early twentieth century, the original farmhouse that had served as the hospital was replaced by a three-story brick building. That building remained on the site and in use by the hospital until the relocation of the medical center in 2001. Halpern Architects was selected to undertake the preservation and adaptive reuse of this significant building. The hospital site was redeveloped into a new neighborhood comprising condominiums, townhouses, and single-family houses. The new condominium building abuts the original brick building, and in fact four individual units cross the boundary between new construction and the historic structure. After consulting with the property owners during the extensive Historic Preservation Commission review and approval process, Halpern Architects developed the designs of the seven condominium units within the historic hospital building, as well as the community meeting rooms and other common areas in the basement. We coordinated our work with the architects of the new condominium building, as well as the many consultants responsible for integrating modern systems such as heating and air conditioning, plumbing, insulation, and extensive electrical work with the sensitive historic fabric of this stately building. We worked with structural engineers to stabilize the existing building during the excavations for the adjacent building, and to delicately cut new openings into the load-bearing masonry structure to serve the changing needs of the building's new occupants.